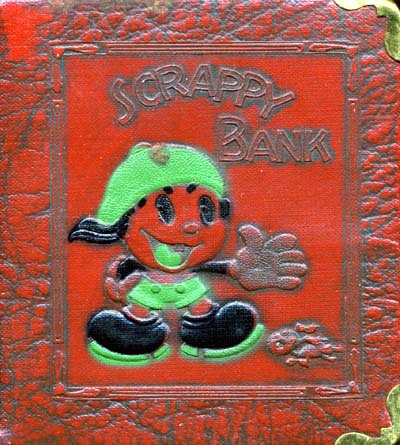 Just a quick note to say that I’m still collecting Scrappy stuff and hope to have an update to Scrappyland up in our lifetime. 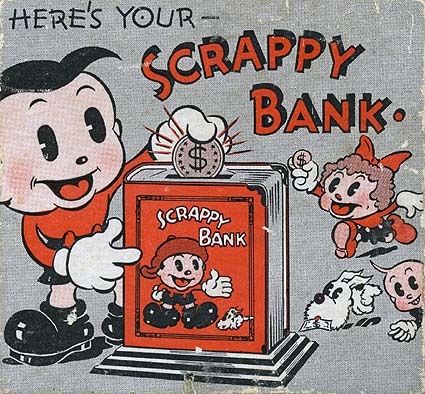 Meanwhile, here’s a quick Scrappy fix–an image from the side of the box that contained the Scrappy savings bank (circa 1935), depicting Scrappy lecturing Margy on the state of her finances while Oopy and Yippy gawk. And here are the other sides of the box. 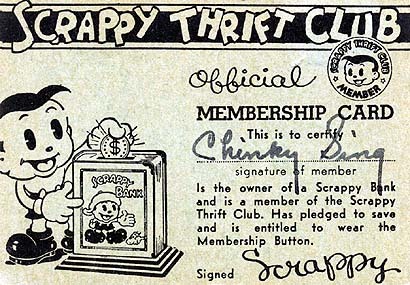 Here’s a snappy Thrift Club card that came with the bank (was it really owned by someone named “Chinky Sing?”). And here, finally, is the leatherette-bound bank itself. See this Columbia Journalism Review e-mail thread for an interesting sidelight on the New Yorker article on P.L. Travers and Walt Disney I recently mentioned. Is the Pixar studio going to become the Disney animation studio? That is, is the building in Emeryville going to be become the nerve center of Disney animation production? Or just an outpost? What does this mean for the leading lights of current Disney animation, not to mention all the foot soldiers working on Disney’s own CGI features? Is Glen Keane going to work for John Lasseter? Will there be massive layoffs? Would someone like Mark Dindal, who, whatever his talents, seems unPixarian flourish under a Lasseter regime? Could you keep the Pixar goodness going indefinitely? Pixar has been around for about twenty years now, with some of the same people and much the same culture. How long would the qualities that make it Pixar take to evaporate within Disney? Five years? Fifty? If John Lasseter were to become President of animation, would his successor be another storytelling genius, or a suit? Will Disney stop releasing pap? Pixar is, above everything else, an extremely tasteful company. Would John Lasseter put a stop to cheapquels? Could he? Would Disney have a Classy Animation Division and a Swill Division? Or might John Lasseter want to produce sequels to Disney films–and actually make good ones? Might we see the Pixar folks make some hand-drawn features? Sounds like a good idea to me? Does the Pixar name disappear? It’s not without value. Will future Toy Story-related products refer to Walt Disney’s Buzz Lightyear? If none of the merging I mull over above happens, then what? Might Pixar just continue as Pixar, producing its own films its own way, while Disney also makes its own CGI films in a parallel fashion? Okay, that’s enough questions for now. Got any answers, or wild guesses? Or questions of your own? Posted by HarryPosted on January 23, 2006 10 Comments on Disney+Pixar=? In recent days, both my blog’s “Comments” feature and the Harry-Go-Round MessageCenter have been victimized by full-blown spam attacks–I’m getting dozens or hundreds of spams a day on both. I’m trying to whack the stuff soon after it comes in, but the onslaught is so relentless that by the time I’ve deleted one batch, there are usually fresh spams already. A Lasseter Era at Disney? Many of the terms have been worked out. The new animation division would be overseen by John Lasseter, Pixar’s chief creative officer and a former Disney animator, who would work with animators at Pixar’s headquarters in Emeryville, Calif., and at Disney in Burbank. It is not yet clear if there would be layoffs, although they would be likely. While Pixar under Mr. Lasseter has thrived, Disney’s animation division has floundered, burdened by its past and its inability to adapt to an environment where pens and paper are being replaced by computers. Analysts say a Disney-Pixar combination would be successful only if Pixar took the reins of animation at Disney, because the cultures are vastly different. “John Lasseter’s role in any new incarnation of Pixar will be crucial,” wrote Katherine Styponias of Prudential Equity. If all of this resulted in John Lasseter running Disney animation, it could be a wonderful thing. Or is there any other person on the planet that you think would be a better choice? Posted by HarryPosted on January 19, 2006 1 Comment on A Lasseter Era at Disney? Posted by HarryPosted on January 19, 2006 5 Comments on Dixar? Pisney? Legion of Super Heroes Cartoon? A correspondent writes to ask if I know anything about an upcoming LSH series. I don’t. 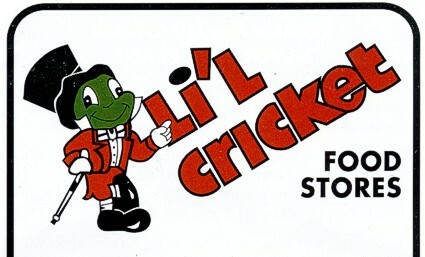 But I figured I’d ask here–anyone heard of one in the offing? Posted by HarryPosted on January 16, 2006 1 Comment on Legion of Super Heroes Cartoon? If you’re into gadgets and gizmos, I think you’ll like Digital World–please check it out.